Space Shuttle Atlantis begins STS-86 by blazing through the night sky in September of 1997. 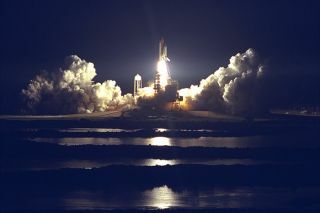 In this historical photo from the U.S. space agency, the Space Shuttle Atlantis blazes through the night sky to begin the STS-86 mission, slated to be the seventh of nine planned dockings of the Space Shuttle with the Russian Space Station Mir. Liftoff on September 25 from Launch Pad 39A was at 10:34 p.m. EDT, within seconds of the preferred time, during a six minute, 45 second launch window. The 10 day flight will include the transfer of the sixth U.S. astronaut to live and work aboard the Mir. After the docking, STS-86 Mission Specialist David A. Wolf will become a member of the Mir 24 crew, replacing astronaut C. Michael Foale, who will return to Earth aboard Atlantis with the remainder of the STS-86 crew. Foale has been on the Russian Space Station since mid May. Wolf is scheduled to remain there about four months. Besides Wolf (embarking to Mir) and Foale (returning), the STS-86 crew includes Commander James D. Wetherbee, Pilot Michael J. Bloomfield, and Mission Specialists Wendy B. Lawrence, Scott E. Parazynski, Vladimir Georgievich Titov of the Russian Space Agency, and Jean-Loup J.M. Chretien of the French Space Agency, CNES. Other primary objectives of the mission are a spacewalk by Parazynski and Titov, and the exchange of about 3.5 tons of science/logistical equipment and supplies between Atlantis and the Mir.